Taking your music to go has never been easier—or more affordable. But with so many new models on the market, whittling down the list can feel a little intimidating. For a party-ready backyard, look for a few of these helpful features before you buy. Audio speakers designed for the outdoors? They’ve been around for years—but recent innovations in weather-resistant components and wireless technology have created a host of new options for taking your music wherever you want. If you live near the water, there’s no longer any need to worry about corrosion caused by damp, salty air. Pick up a model with marine-grade hardware and aluminum grills, and your speakers will withstand wet or snowy weather for years. Some versions double as docking stations for portable music devices. Many connect wirelessly to smartphones, tablets, or laptops, so you won’t have to wrestle with wires and staple guns during installation. And if you don’t love the look of a regular sound system, you can try “rock speakers” instead. 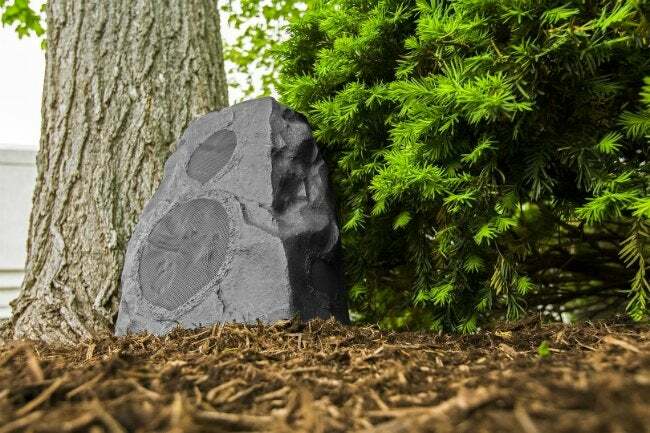 They’re designed and manufactured to look like the real thing, so they won’t look out of place by a tree or in your deck-side garden. Once you’re done, you’ll have the Beatles to go along with your begonias!